Last week we went to the bulk store to buy some seeds and coconut to make more granola. (More on that another time.) Because once I’m there I always remember a few other things we need, we walked up and down all the aisles picking up some essentials: couscous, nuts, chocolate covered sponge toffee. We came across some seasonal sprinkles: ghosts, pumpkins, skulls, black and orange mixed sprinkle sticks… you get the idea. Of course a couple baggies-full made it into our cart. As we drove home chewing our dried mango, I wondered if I had a enough soft butter on the counter to make a quick batch of cookies. How else could we use these little dessert toppers? 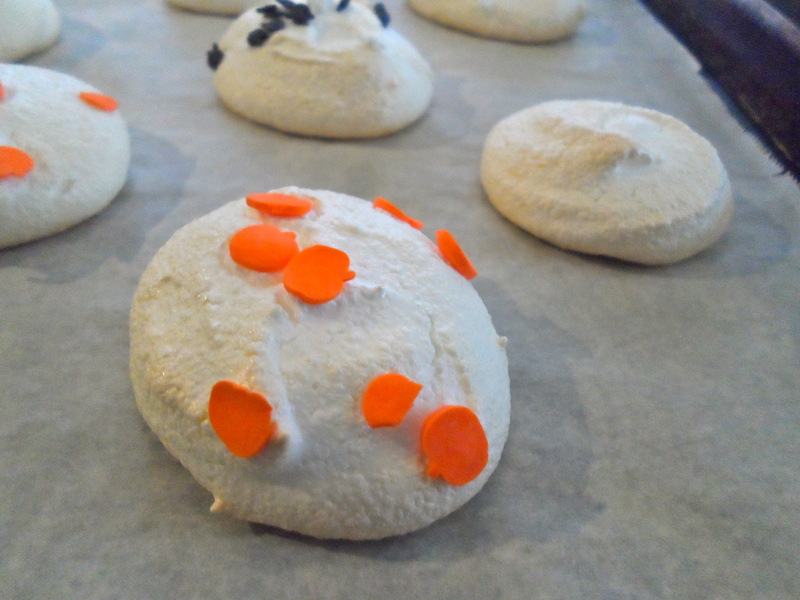 And then I thought of it: meringue! egg white, sugar, 10 minutes in the oven… done! So I beat the egg white and had help spooning in the sugar a little at a time. Mounded on the paper, the sprinkles came out. Again I had help, and then into the oven. Easy, gooey, delicious and fast. Like I said, what’s easier than meringue? beat 1 egg white until frothy. add 1/3 cup sugar a little at a time. 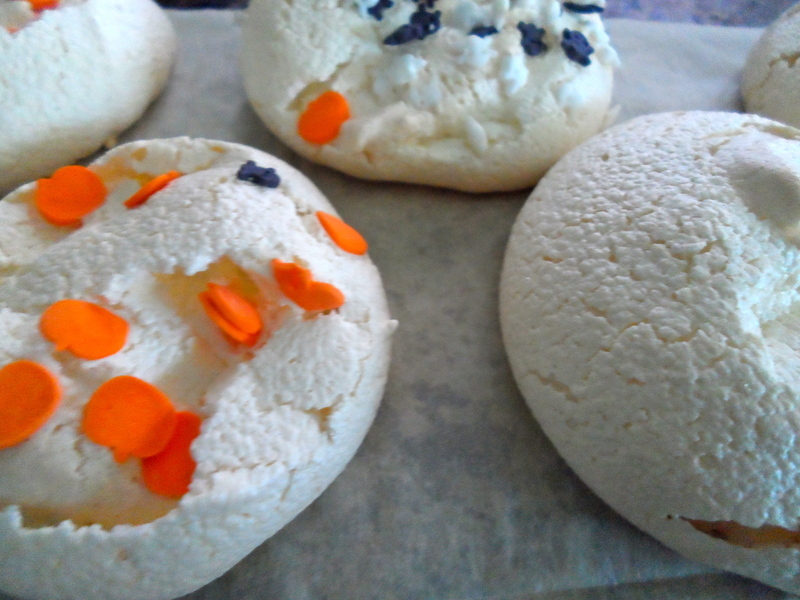 mound spoonfuls onto a parchment-lined baking sheet. they will puff up once cooked, and deflate as they cool. make sure they are completely cool before trying to remove them from the pan – or they will not lift off and you will be frustrated as they crumble and stick simultaneously. Previous POLL! olives: black or green?